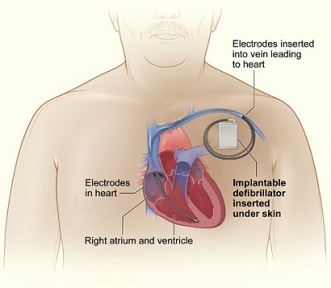 An implantable cardioverter defibrillator (ICD) is used in patients at risk for recurrent, sustained ventricular tachycardia or fibrillation, which leads to SCA. The device is connected to leads positioned inside the heart or on its surface. These leads are used to deliver electrical shocks, sense the cardiac rhythm and sometimes pace the heart, as needed. The various leads are tunnelled to a pulse generator, which is implanted in a pouch beneath the skin of the chest or abdomen. These generators are typically a little larger than a wallet and have electronics that automatically monitor and treat heart rhythms recognized as abnormal. Newer devices are smaller and have simpler lead systems. They can be installed through blood vessels, eliminating the need for open chest surgery. When an implantable cardioverter defibrillator detects ventricular tachycardia or fibrillation, it shocks the heart to restore the normal rhythm. New devices also provide overdrive pacing to electrically convert a sustained ventricular tachycardia, and "backup" pacing if bradycardia occurs. They also offer a host of other sophisticated functions (such as storage of detected arrhythmic events and the ability to do "noninvasive" electrophysiologic testing). ICDs have been very useful in preventing sudden death in patients with known, sustained ventricular tachycardia or fibrillation. Studies are now being done to find out how best to use them and whether they may have a role in preventing cardiac arrest in high-risk patients who haven't had, but are at risk for, life-threatening ventricular arrhythmias. Though generally implanted in older patients, ICDs have been used to successfully treat very young children. The occurrence of ICDs in the young adult population is increasing as well.